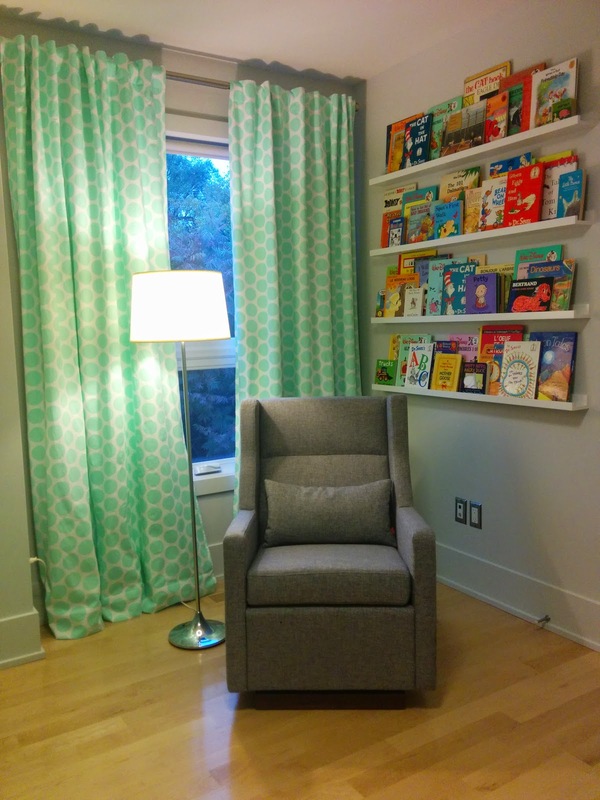 The inspiration for this project came from Emaline's Elephant Nursery on Project Nursery. Similarly, I planned to put up 5 picture rails, however after installing 4 I decided to skip the bottom one for now in case I find a small side table I'd rather use next to the glider. I used the Ikea Ribba Picture Ledge in White, in the longest length, 115cm. 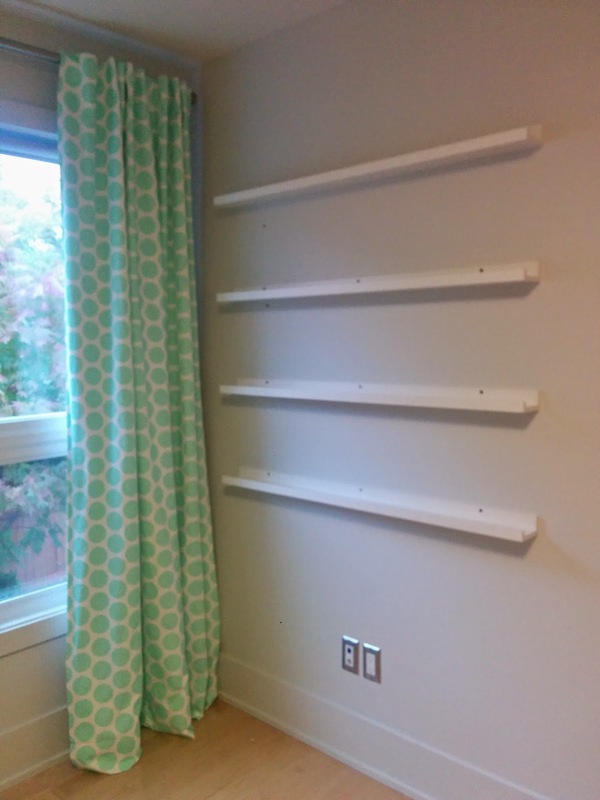 Putting these up is fairly straightforward, but here's how I did it to ensure the shelves were perfectly lined up and level. Decide where to position each rail. First, I determined that most of the tallest children's books were 10 - 11 inches high. I wanted at least an inch and a half between the top of a tall book and the next rail, so I opted to position the rails 13" apart, leaving a gap of about 12 and a half inches between rails for books. I then calculated 13"x 5 = 65" as the total height of the finished look, since I was planning to put up 5 rails. I roughly wanted the top of the topmost books to line up with the top of the closet door frame, and the bottom rail to be sightly above the outlets on the wall. 65" was slightly taller than the space I had, so I moved it up a couples of inches until I was happy with the space taken. Try to find a stud where you'd like to centre your picture rails. If you can't find one in the centre, then attempt for either one of the two sides. I was planning to centre the rails on the wall, but opted to move the rails over two inches to the left to secure the centre screw of each rail into a stud. Select an appropriate centre point based on your success finding a stud. Position the top rail at the correct height so that the top of books will line up or be just above the average door frame in your room. With a pencil, mark the wall where the centre screw needs to be placed according to the centre point determined above. 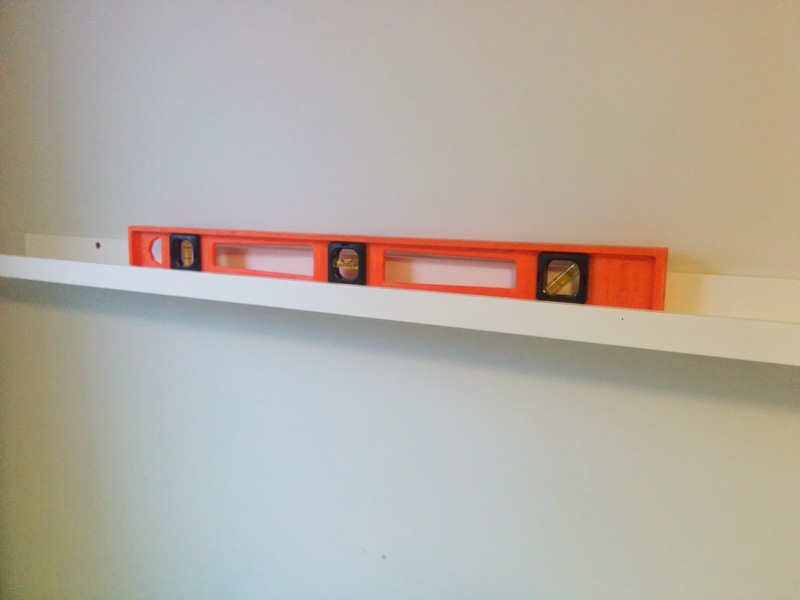 Use a level with a ruler to measure out the distance between shelves. So from that pencil mark, I measured straight down 13", ensured it was level then marked the wall. Repeat for all shelves. If you have 5 shelves, you should have 5 pencil marks on the wall when you're done. Screw in the rails one at a time. Start with the centre screw, but don't tighten it completely. 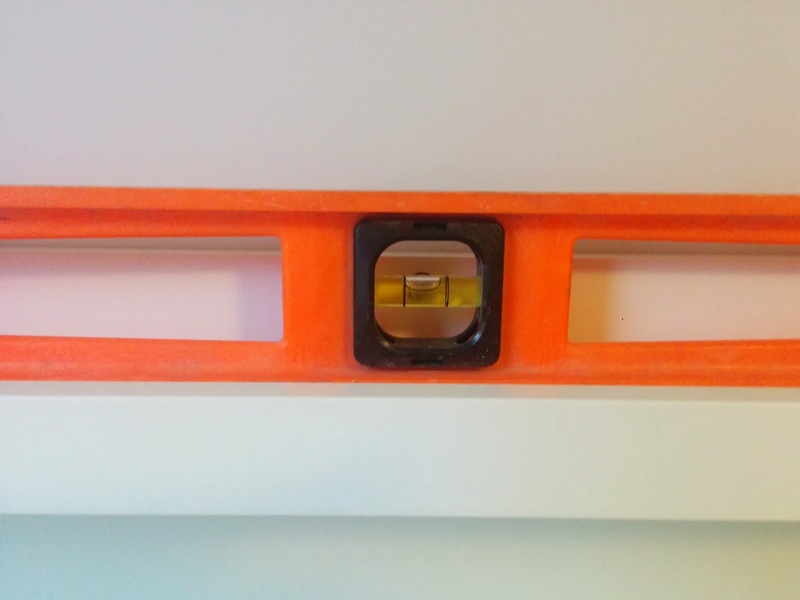 Place the level on the shelf and tilt the shelf until its level. Remove the level and screw the centre screw in tightly. Screw in the left and rightmost screws. Repeat for all of your shelves. And finally, the crowning moment, position your children's books! 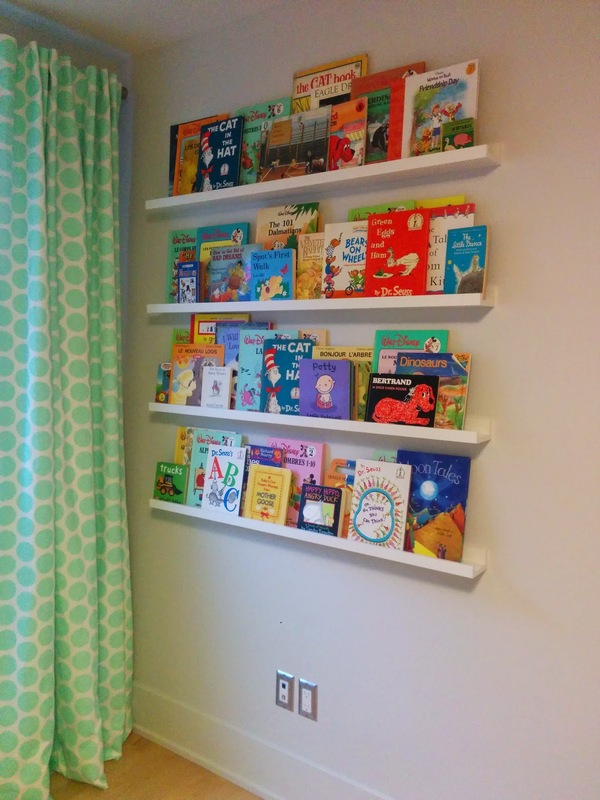 Lay out the tall ones across multiple shelves first, distributing similar books to balance out the look of the shelves. Layer books on top, progressively getting smaller until you've positioned all of your books. I simply love the pop of colour this adds to the nursery!